Now there may be other binaries here in Genesis 1, but these are the ones I want to focus on. “Formless and void” (tohu wavohu) comes to mind as a distinct possibility. This structure is intentional at several levels but it does show order coming from chaos, countering the formless and void state described in Genesis 1.2. Here again is our list of binaries with a suggestion of how to see the hendiadys. In each case God, as it were, turns to the created thing to invite it to work with him in the ongoing task of creation. So, for example, God says to the earth to bring forth vegetation, plants and seeds (1:11-12). He says to the waters/seas and the skies: bring forth fish and birds (1.20-23). Then God says to the land: bring forth land creatures of every kind (1.24-25). When God says, “let us make humanity . . . ” people have wondered about the “us.” Is God speaking to and for the Trinity? Not necessarily. That certainly is one way Christians have read the text. Given everything that has gone on so far in Genesis 1, however, I think God is speaking to the created order itself. The “us” would include God, the sun, moon, stars, waters, seas, dry land, and other land creatures. Human beings are made up of the same elements as the stars, the earth, and all the critters. Now, I’m not arguing that we should have a scientific reading of Genesis; what I am suggesting is that there is an internal logic to the creation story of Genesis 1: God creates something and then uses that creation to create the next thing. In this way all things are dependent and related. Genesis 2 reinforces this when it says that God sculpted Adam/humanity from the earth/dust and breathed in him the breath of life (2.7-9). So Adam is made up of previously created elements along with the divine breath. The crown of God’s creation is a new creature, a creature that can sound the heartbeat of its Creator. That creature, made male and female, reflects God’s own relational richness. The human family is to join God in the ongoing work of creation. The earth below and the sky above with all their inhabitants are too beautiful and too good to be left alone. They need the tender care and close attention that only God’s favored creature can give. In Genesis 1:28ff. God blesses the humans and gives them the prime directive: be fruitful, multiply, and fill the earth. In other words, humans are now directed to participate with God in the ongoing work of creation. God no longer creates ex nihilo. He uses preexisting elements and persons in order to fashion the next generation. 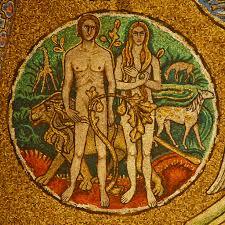 Through the sexual union male and female become one flesh and life as we know it goes on.